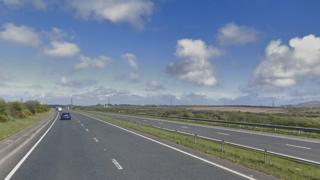 A man has died in a three-vehicle crash in Cornwall. Two cars and a lorry were involved in the crash on the eastbound A30, two miles from the Victoria Interchange, in the early hours of Saturday. Devon and Cornwall Police said one car's driver was pronounced dead at the scene, two people in another car suffered "moderate injuries", and the lorry driver was unhurt. The force has appealed for witnesses or dashcam footage of the crash.